Zero gravity lift with advanced technology. 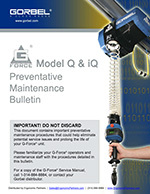 Ergonomic Partners utilizes the Gorbel G-Force models Q and iQ to integrate with zero gravity lifting devices for precise, quick placement of parts. This servo hoist is an intelligent assisted lifting device (IAD) with unmatched speed and precision. 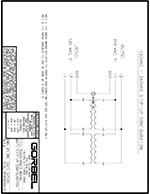 You can also find guides, configuration, and highlights of G-Force features on our Gorbel Product Videos page. 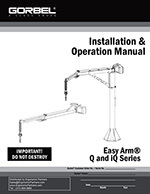 Infinite Speed and Control - The G-Force and Easy Arm move with the operator. They move as fast or as slow as the operator chooses to move. They are ideal for applications that require high speed at some points in the cycle and slow, precise movements at other points. Blazing Speeds - With speeds reaching 200 fpm and Easy Arm speeds reaching 180 fpm. These devices travel up to four times faster than traditional high-end lifting devices currently on the market, making them the fastest, most precise zero gravity lifting devices on the planet. Pinpoint Precision - The Gorbel G-Force Hoist delivers unparalleled precision with speeds of less than 1 fpm. This gives the operator the control necessary to finesse expensive or fragile parts. 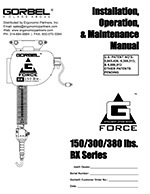 The Safe Alternative - Operators want to use the Gorbel G-Force hoist because they're easy to learn and easy to use. 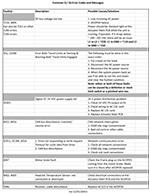 They are safer than manual lifting and dramatically reduce worker injury cost. Anti-Recoil Technology - This prevents the hoist from moving or recoiling when there is a sudden change in load, reducing the risk of potentially serious injury. 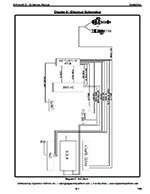 Capacities and Overload Protection - The unit will not lift if the load exceeds the rated capacity. 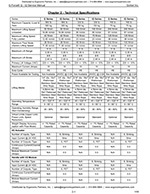 Capacities available in 165 lb., 330 lb., 660 lb., and 1,320. 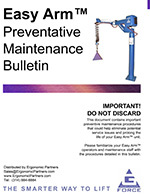 Power Loss Protection - A fail safe load braking system lock the unit in place in the event of a power loss. Operator Present Function - The handle grip of the Gorbel G-Force and Easy Arm uses a built-in photo sensor that doesn't allow the unit to move unless the operator initials the movement. 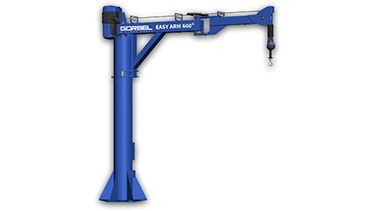 Float Mode Option - Both Gorbel hoists offer a versatile Float Mode. With a mere 1/2 pound (227 g) of force on the load itself, operators can precisely orient loads throughout the full stroke range by manipulating the load with their hands. This makes the unit truly a zero-gravity lifter. The Smart Investment - G-Force technology makes your work force more productive by increasing their efficiency and enabling them to perform complex tasks. The Gorbel G-Force and the Easy Arm are more cost effective than completely robotic solutions and they don't require the costly custom programming that robots need to perform even the simplest tasks. 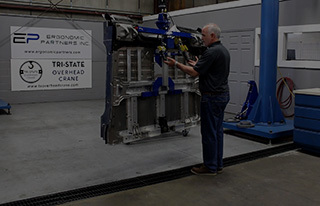 Bridge Crane Mounted INTELLIGENT Lifting Device - More precise than hoists, more responsive than air balancers, our bridge crane mounted Gorbel G-Force units improve safety, productivity and quality, resulting in a direct increase to your bottom line. 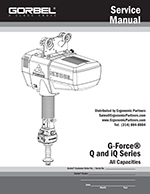 Ergonomic Partners sells and distributes G-Force Products, Hoists and Cranes; serving clients from coast to coast, Canada, Mexico and especially focused in the states of Missouri, Illinois, Indiana, Kansas, Arkansas, Mississippi, Nebraska, Tennessee, Kentucky, Iowa, and Oklahoma.